I. THEME: St. Joseph became righteous by putting his faith in God. People are always divided between the two things: on the one side, the absolute faith in God’s wisdom and power; on the other side, human reasoning. When there is a conflict, which way should people follow? Many people think that they only do what they can understand; beyond that, it is superstitious or illusionary. These people forgot that their intellects are very limited; there are truths that exist no matter if they can understand or not, as the prophet Isaiah stated what God said to human beings: “For my thoughts are not your thoughts, nor are your ways my ways, says the Lord.As high as the heavens are above the earth, so high are my ways above your ways and my thoughts above your thoughts” (Isa 55:8-9). The Scripture proved many times that if people obey and do God’s will, they shall prosper and achieve results which are exceeding their expectation; but if they disobey God’s will and do their will, they shall be miserable and endure many unwanted results. Today readings illustrate three exemplars of faith, Abraham, David and St. Joseph, who did God’s wills though they didn’t understand them. In the first reading, David wanted to build a temple for God to dwell but God didn’t want him to do that. After Naaman revealed God’s will, David obeyed God and stopped his plan. In the second reading, God promised to give Abraham a great descendants. Abraham believed in God’s promise even though he had only two sons, Isaac by Sarah and Ismael by Haggar. This promise is fulfilled in Christ because all who believe in Christ are Abraham’s descendants. In the Gospel, St. Joseph obeyed God’s messenger and welcomed Mary into his house, even though he didn’t understand what “Mary was conceived by the Holy Spirit” meant. 1/ Reading I: Your house and your kingdom shall endure forever before me. The key word here is “bayit = a house.” It can be understood either as “a place to dwell” or “a household, family” (cf. Gen 7:1, Jos 7:4). God revealed to David that it is not him to build for God a house; but it is Him who shall build a household for David. The Messiah shall come from this household; he shall govern all people, and his kingdom shall last for ever. God’s promise was constantly threatened by disobedience of David’s descendants; there was time when people thought that God’s promise came to an end, as in the exile because there was no king nor kingdom. But God was still loyal to His promise until the day that the Messiah came from David’s lineage, and he shall reign for ever. 2/ Reading II: Abraham and his descendants would inherit the world through the righteousness that comes from faith. 2.1/ God’s promise is hard to believe: When God promised to Abraham that He shall give him a numerous descendants as stars in the sky and as sand on the seashore, Abraham didn’t have a child even though he was too old (Gen 15). (1) God’s promise was given to Abraham as a gift: Abraham didn’t do anything to be worthy of God’s promise except to believe in God, as St. Paul said: “For this reason, it depends on faith, so that it may be a gift, and the promise may be guaranteed to all his descendants, not to those who only adhere to the law but to those who follow the faith of Abraham, who is the father of all of us.” Moreover, the law, which was given by God through Moses, came to exist much later. In Abraham’s time, there was no Ten Commandment for people to observe! (3) People are justified by faith, not by keeping of the law: St. Paul continued to say: “That is why "it was credited to him as righteousness. "” One prominent thing in Abraham’s life is his faith in God. He didn’t see God’s promise was fulfilled during his lifetime. Moreover, he was also tested by God, as in the event which God wanted him to offer his son Isaac as an oblation on Moriah mountain. In all cases, Abraham kept his faith in God; that is the reason why he was credited as the righteous. Similarly, people are justified by their faith in God, not by keeping of the law; because none can perfectly keep the law. 3/ Gospel: St. Joseph did exactly as God’s messenger commanded him. 3.1/ St. Joseph’s faith was tested: His engagement with Mary was under God’s providence; but St. Joseph couldn’t accept Mary’s pregnant when the two didn’t live with each other yet. (1) Legal situation: Jewish tradition about marriage is similar as Oriental tradition. There are three stages in marriage: Firstly, it is the promise of marriage which is done by the parents of both sides when they are still young. This period isn’t binding if one of them decides not to follow their parents’ promise. Secondly, it is the period of engagement which used to last about one year. According to Jewish law, the couple is officially married though doesn’t live with each other. If they want to divorce, they must go through the procedure of legal matter. 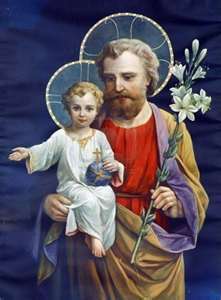 St. Joseph and the Blessed Mary were in this period. Lastly, it is the marriage when the couple live with each other as husband and wife. (2) St. Joseph’s solution: St. Joseph certainly knew that Mary’s pregnant wasn’t from him. As the righteous one, he couldn’t accept Mary’s pregnant. St. Joseph had two ways to solve the problem: either he accuses Mary of infidelity and she shall be stoned to death or secretely leaves her. Out of compassion he had for Mary, St. Joseph didn’t want Mary to be stoned to death, he intentionally planned to secretely leave her. 3.2/ God’s will: According to St. Matthew, “the angel of the Lord appeared to him in a dream and said, "Joseph, son of David, do not be afraid to take Mary your wife into your home. For it is through the Holy Spirit that this child has been conceived in her.She will bear a son and you are to name him Jesus, because he will save his people from their sins. "When Joseph awoke, he did as the angel of the Lord had commanded him and took his wife into his home. (4) He re-creates or renews the creation (cf. Gen 1:2; Jdg 6:34; 11:29; 13:25; 15:9; 1 Sam 10:6; Psa 51:10; 143:10; Job 33:4; Eze 37:1-14; Acts 2:1-4). Being educated in this tradition, St. Joseph accepted Mary’s pregnant though he knew for certain it wasn’t by him. He didn’t ask God’s messenger to explain the fact “Mary was conceived by the Holy Spirit;” but he believed that the Holy Spirit is the cause of it. In his family life, St. Joseph always let the Holy Spirit to guide him through all critical moments of his family. The Scripture reported three times in his life beside today event. Firstly, he accepted to engage with Mary to become the Messiah’s foster father. Secondly, he brought Mary and the Child to flee to Egypt at night, without asking what he is going to work for a living there. Lastly, he brought his family back to Israel, and established his house in Nazareth, without complaining that he had to relocate one more time. In brief, St. Joseph didn’t leave a single word for us, but he let us an exemplar of the one who always listens and quickly does God’s will. He completely trusted in God’s power and humbly did what God commanded because he knew that his human reason can’t fathom God’s providence. - We are justified by our faith in God and Christ, not by anything that we have done. - Trials and sufferings in life are occasions for us to show our faith in God. We should always live according to the Holy Spirit’s guidance. - God is always faithful to His promises; therefore, we need to put our complete trust in Him.